Are you planning a trip to Hawaii? If so, you’re definitely in for a total adventure. One of the most travelled and visited tropical places in the world, Hawaii is home to the best beaches, resorts, and sceneries in the world. In this article, we will provide you with a comprehensive guide on when and where to go, what to do, and learn more about the islands. Of course, the first question you should be asking when planning to visit Hawaii is when is the best time. Honestly, with the fact that the lowest average temperature in the Aloha state being always above 70 degrees, we can say that there’s no such thing as a “bad time” to visit. This means you can go there whenever you want, whatever part of the year. There is a lot to discover in the six islands of the Aloha state. For one, they are home to the most distinctive and lovely treasures (and beaches!) that you won’t have the luxury to find in other tourist destinations. 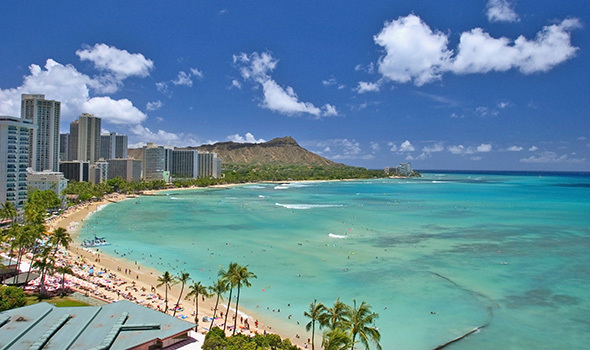 First on the list are the wonderful shores of Waikiki Beach located in Oahu. You can’t go to Hawaii and miss this. Also, there’s the Napali Coast on Kauai, the dramatic cliffs being the best and most popular landmark. If you can’t get enough of white sand beaches, you should try the Papohaku Beach in Molokai. And if you’re one of the thousands of tourist who come to Hawaii to get really up close and personal with dolphins, there is the dolphin-friendly waters in Hulopoe Bay. As you can see, there are just too many options and places to plot on your first visit to the Aloha state, and you might even be a bit confused on what to prioritize on your first visit. But then again, we assure you there are no disappointments or regrets to any of those mentioned spots. But of course, every single adventure to Hawaii starts at Honolulu International Airport in Oahu. It is the state’s primary airport that serves as the main entry point for tourists and visitors. But there’s no problem getting there since all major domestic carriers in the U.S., as well as other international carriers serve Oahu. It means there are lesser connecting flights and you can get there from practically every corner of the world. Aside from Oahu, you can also get to direct flights from the U.S. to Hawaii Island, Maui, and Kauai. If part of your itinerary is Lanai and Molokai, you may have to go through Oahu. Travel to Hawaii is one of those adventures you do that won’t give you reasons to rest. There’s a lot of do when you’re in the islands. Of course, you immediately smell the fresh nature in the air at the very moment you step out of the plane. Probably one of the best ways to start the adventure is to visit the historic landmarks of Hawaii, and yes, there is plenty to see and learn, including the diversity and richness of the culture. Next, spend days exploring off-the-beaten-path destinations, or those that other visitors don’t really include in their itineraries. Part of which are many hidden beaches, small towns, and isolated spots. If you are the adventurous (and crazy) type, go learn some surfing and kayak. But for us, the best experience in the sea would be snorkel. With the beautiful sun shining practically all year round, you go ahead get your world-famous Hawaiian suntan! But the islands is not just about the beach. As we mentioned earlier, the culture is something you need to explore as well. There’s the authentic luau where you can see Hawaiian culture at its best and the art of the hula, of which the people of Hawaii is quite famous for. You can do swimming, culture exploration, and of course, shopping in Hawaii. In the end, you will realize your future itineraries on Hawaii will be endless as there is so much more to explore.